Smart ID Scan can help prevent you from becoming a victim of ID theft. The Smart ID Scan searches the files on your PC for any traces of personal ID information including credit cards, social security numbers, driver’s license, passwords and more. 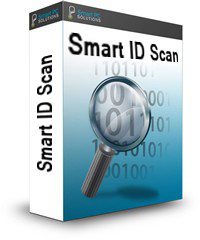 Smart ID Scan deep scans the files on your PC for any traces of personal ID information. You can help protect your personal information by shredding any documents on your PC which contain potential ID leaks including social security numbers, credit card numbers, bank account numbers, passwords or user IDs. Don’t risk becoming a victim of ID theft. Run a simple scan with Smart ID Scan today and make sure there is no valuable personal information in the files on your PC. Smart ID Scan helps you protect your most valuable personal information. You might actually be surprised when you run a Smart ID Scan and find out how much personal information is easily available to hackers in the documents or files on your PC. Maybe you’ve stored passwords or credit card numbers in excel spreadsheets? Perhaps you have documents, contracts or other files on your PC which contain sensitive personal information. Storing your personal ID information in random files on your PC is not secure and leaves that information exposed to possible hackers. Smart ID Scan deep scans your PC for any traces of personal information including credit card numbers, social security numbers, bank account numbers, passwords, user names and more. The Smart ID Scan searches inside documents, spreadsheets, compressed files and other file formats looking for your personal ID information. If files are found then just deleting these files is not enough to keep them safe from potential ID thieves. Smart ID Scan enables you to shred the files which makes them unrecoverable by even the most sophisticated data recovery programs. Smart ID Scan is a simple solution for quickly finding and safely removing any files on your computer which contain sensitive personal information. Run a Smart ID Scan now and make sure there are no possible ID leaks on your computer.